An unusual group founded by environmentalists and logging companies, the Willapa Alliance seeks to bring economic and ecological healing to Washington's Willapa Bay. Alana Probst in her own words on creating sustainable economies for Washington's Willapa Bay. 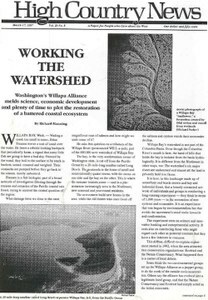 In his own words, editor Matt Winters of the Chinook Observer gives his view of the Willapa Alliance. Fisherman Les Clark in his own words on the ecological problems and decline of salmon in Willapa Bay. Ecotrust founder Spencer Beebe in his own words on Willapa Bay. Chicago's Shorebank Corp. leads in innovative attempts to raise loans and create business development in the Willapa Bay area. Carlota Copper Co.'s plan to dredge and fill Arizona's Pinto Creek in a mining operation leads to strong opposition throughout the state. "Green Scissors: Cutting Wasteful and Environmentally Harmful Spending and Subsidies" describes how to cut the budget and protect the environment at the same time. The Predator Project's report, "Conserving Prairie Dog Ecosystems on the Northern Plains," defends the much-maligned rodent's importance. The BLM's management plan for Idaho's Owyhee Resource Area raises fierce opposition from ranchers and ORV enthusiasts. The report, "Logging Without Laws: A Report on the Timber Salvage Rider of the 104th Congress," is available from the Alliance for the Wild Rockies. The National Wildlife Federation's first-ever National Conference on Habitat Conservation Plans is May 17 and 18 in Washington, D.C.
"The Raven Chronicles" magazine seeks contributions with a deadline of May 1. Physicist Val Veirs' detailed report, "Carbon Monoxide Forecasting for Colorado Springs: 1996-2020," is available on the World Wide Web. A desert gathering April 25-27 will protest a proposed low-level nuclear waste dump planned for Ward Valley, 20 miles west of Needles, Calif.
Utah grebes miss water in their landing; Airedale stomped by Jackson Hole moose; woman arrested for feeding ice cream to bears near Tucson; ravens feed themselves in Yellowstone; Utah men land plane with the help of bodily fluids; snowboarder lingo. Rosalie Sorrels in concert, FYI on the lead this issue, some valentine in Boise, Idaho. A slew of bills - some wacky - introduced in Montana's Republican-dominated legislature could weaken environmental protection and anti-discrimination laws. Environmental activist Judi Barr, who survived a car bomb on the eve of Redwood Summer in 1990, dies of cancer at home in Willits, Calif. Interior Secretary Bruce Babbitt, frustrated in his attempts to reform the 1872 Mining Law, creates a task force to find ways to prevent environmental damage from mining without changing the law. State officials are racing to draw up "emergency" grazing rules so ranchers can turn their cows out as usual this spring. Businesses in the ski town of Crested Butte, Colo., have begun offering a 1 percent surcharge on purchases to buy more open space. Oregon Gov. John Kitzhaber lands $30 million to try to restore the coho salmon without having to list the fish as endangered. Will an elusive cat evade federal listing? A very rare sighting of a jaguar by a rancher in southern Arizona rekindles a debate about whether to list the animal as endangered or find another way to protect it. A flap over the appearance of Sen. Ben Nighthorse Campbell, R-Colo., in Banana Republic clothing ads highlights the interesting character of a man who seems less interested in being a senator than in doing other things. A notorious drug smuggler's obsession with reclusiveness leads to his arrest - and his Wyoming ranch, which abounds with wildlife and fronts the Clark Fork, is now in public hands. California's easily accessible and overcrowded Desolation Wilderness plans to begin collecting fees for formerly free uses - and not everyone is happy. The Clinton administration is still scrambling to find the $65 million worth of federal property to pay off the Crown Butte Mining Co. and keep it from going ahead with its New World Mine on the Yellowstone border.